Pomelos, sometimes spelled pummelos, are a winter citrus fruit. Unlike oranges, they are a bit more difficult to find year round. Similar to the sweet and sour flavors of a grapefruit, the flavor of pomelos is more muted with a lot less free flowing juice. The pulp stays perfectly contained within each tiny pulp pod making it an ideal ingredient for presentation purposes. Perhaps the most difficult part of this recipe is peeling the fruit. In Thailand, they often sell this on the street pre-cut, peeled, and packaged on styrofoam trays (as pictured above). In order to peel your own pomelos, it is a matter of getting your fingers within the white skin membrane and hand tearing away. Knife work will only go so far and merely segmenting with a paring knife will not do. Time to put those fingers to work to gently peel away the connective membrane to unveil the rosy pink pulp inside. You will end up with some intact wedges and some chunks of flesh, either of which works for this salad. 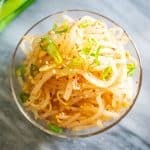 The dressing for this Thai pomelo salad is the ubiquitous fish sauce dip, used on many Thai dishes, with a combination of fish sauce, lime juice, sugar, and fresh chopped chili. Top with fresh torn mint leaves and chopped peanuts for color contrast and crunch. Since pomelos are so refreshing, this would make a palate-cleansing first course, before moving on to the next richly flavored one. The pomelos can be peeled well in advance since the juice does not leech out of the pulp. Prepare a few hours or the day before. Similarly, make the fish sauce dip ahead of time. Keep in the fridge and use as an alternative salad dressing. This Bordeaux style blend composed of 64% Sémillon and 36% Sauvignon Blanc is from the famed Bonny Doon vineyard in the Santa Cruz mountains of California. Founded by Randall Graham in 1983, it was one of the first wineries in the US to embrace Rhone varietals. This wine is at once crisp, soft, and slightly acidic. 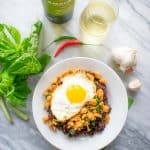 The citrus notes work well with the pomelo, and the wine is versatile enough to accommodate the slight heat from the Thai bird chili. 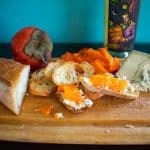 This wine also pairs nicely with creamy hachiya persimmon crostini. 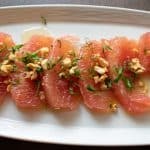 Cool, refreshing, and bursting with juicy flavors, this pomelo salad is waiting to come alive in your mouth. Give pomelos a try. For another similarly flavored Thai salad, check out this Thai Winged Bean Salad. Sweet, citrus-y pomelos are paired with the spicy heat of the tiny Thai bird chile and fish sauce dip in this Thai pomelo salad. 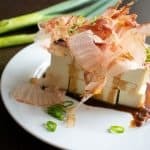 Cool, refreshing, and bursting with juicy flavors, this pomelo salad is waiting to come alive in your mouth. Mix together fish sauce dip ingredients. 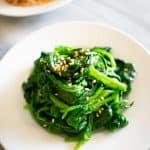 Make ahead up to 1-2 days, stored in the refrigerator. Peel pomelo and remove all white membrane. Arrange sections on a serving platter. Spoon over fish sauce dip, and top with garnish of mint and peanuts. If you can't find pomelos, you can use grapefruit; it will just be a lot wetter and juicier.